I'm excited to announce that we just finished the largest (and longest) project in the history of Less Annoying CRM. Our calendar has been rebuilt from scratch, and it's going to change how you use events and tasks in the CRM. When my brother and I started Less Annoying CRM over eight years ago, we were the only two employees. Every new feature was built by one of us, and since we were spread so thin, our normal approach was to keep things very basic. This works well for many things (basic and simple sometimes go hand-in-hand) but there are some features that are so critical our users' day-to-day lives that they really need to be robust and feature-complete. Since the day we launched our original calendar, we knew that it wasn't really "finished". It didn't have recurring events, all-day/multi-day events, color-coding, and so many other things. Also, while we've supported Google Calendar syncing for years, some users (including us with our internal calendar) have experienced annoying duplication issues. To put it plainly: our calendar wasn't very good. We started re-building the calendar back in 2015. That's right, almost three years ago. I won't bore you with all of the details, but I'll just say that the project has been a major learning experience for me in terms of how to build a tech team (it's not just me coding anymore) and how to effectively manage a large-scale project. About a year into the project we basically started over from scratch because it wasn't being built on the right technological foundation. We spent 2016 putting together LACRM version 3.6 which would act as the new foundation, and 2017 was spent building the calendar again. The result is that this new calendar took a lot longer than expected, but I'm thrilled with the results. Even more exciting is that with the lessons we've learned over the last few years, we're in much stronger position going forward, and new features should go a lot smoother. So what's new with the calendar? This is probably the #1 feature our users request in the entire CRM. You can now create recurring/repeating events in LACRM just like you can in Google or Outlook. Previously you could only create events with specific start and end times. This made it difficult to track calendar items that take up the whole day such as travel, conferences, etc. 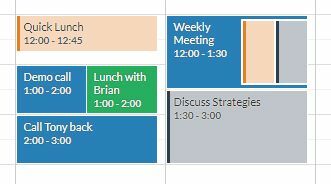 Now there's a section at the top of the week view that shows your all-day events, and we prioritize those on the month view so that you can get a better sense of your high-level plans for the month. You can also create normal events that span more than one day if you want (previously you couldn't have an event go past midnight). This is another highly-requested feature. Previously each user on your calendar was automatically assigned a color, and there was nothing you could do to change that. Now you can create as many sub-calendars on your account as you want, and you can pick a color for each calendar. For example, you could make a "work" calendar with blue events, and a "personal" calendar with green events. You can also set the colors you see for other users on your account so you have complete control over how your calendar looks. These sub-calendars also apply to tasks, so you can now use sub-calendars to prioritize the tasks on your Workspace! Note: only you can see which calendar a specific event or task is on. To other users it will look like everything is on one calendar, although you can choose to keep certain calendars private. We heard a few common complaints with our old Google sync: events would sometimes be duplicated, the sync took too long, and it could only sync with a single Google account. Well, those are all much improved. You can now sync with multiple different Google accounts and different sub-calendars within each account. The sync should be almost instant going both directions, and the duplicate issues seem to be a thing of the past. Integration projects like this are very complicated, and so we expect some new issues to crop up as more people start using the new sync, but it's already significantly better than it was, and we'll keep working on it to iron out any edge cases we missed. We've made some subtle improvements to the forms you use to create/edit events and tasks. Events now show you a preview of the schedule for whenever you're scheduling an event, so you can be sure you aren't double booking yourself. We also added a "location" field and support for different timezones. The task editor now has a separate "description" field so that you can enter additional notes about the task without cluttering up the main task name. 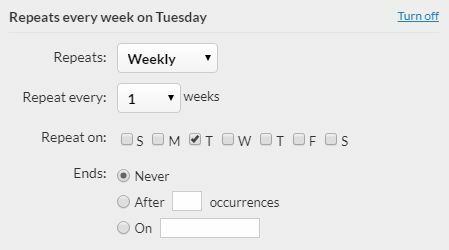 We also changed how the date fields work so that you can type a date in directly rather than only being able to select it from a mini-calendar. This will make it much easier to schedule things that are months or years in the future. I'd like to extend an apology to all of our customers who aren't based in the US. For years you've had to see your calendar start on Sunday just because that's how we do things here in the states. Now you can have your calendar start on any day of the week you want. We also added the ability to set the default event duration, as well as a few other new settings. I've covered the major new features, but there are countless improvements that I haven't mentioned. Overall, you should notice a much more polished and thought-out interface. I think this will be especially apparent for teams of multiple people that share calendars. When we built the first calendar, there were only two of us, and it got the job done. As our team grew, we started noticing all the ways in which collaboration could be improved, and we spent a lot of time trying to get those little details right. Robert was the lead developer on this project. He's been working on it non-stop for the last year and there's no question that the new calendar wouldn't exist without his efforts. Mitch was responsible for the new Google Calendar sync. If you enjoy not having to wait three hours for events to sync anymore, you have him to thank. Nic was responsible for the recurring events logic. We all take recurring events for granted, but when you take a second think about how confusing all the different rules can be and all the potential edge cases, you'll be glad there are people like Nic solving these hard problems so that the rest of us don't have to think about it. I'd also like to thank all of the CRM Coaches who have help tremendously by providing ideas and feedback as well as testing out the new calendar. We've been using the new version for several months already and there have been literally hundreds of suggestions sent to the developers to make sure the calendar is as polished as possible. And last but not least, we've had about 100 customers beta testing the new calendar for the last couple of months. We really appreciate all of the feedback they've given, and their willingness to put up with bugs so that the rest of our users don't have to. Control over the layout of the forms (e.g. moving/hiding default fields that you don't want). Showing custom date fields in the calendar view and including them in agenda emails so that you can be reminded about special dates without needing to manually create events or tasks for them. We hope to one day be a complete project management tool. This improvement won't get us all the way there, but it'll be a step in the right direction. Right now we have three full-time developers in addition to the two co-founders. We've already hired two more developers who will be starting this summer, so we'll have even more resources to devote to improving Less Annoying CRM. I can't tell you how excited I am about this new calendar, and about the future of Less Annoying CRM. I really appreciate every single customer who is taking this journey with us, and I can't wait for you to see what's coming!